Here is a wonderful dish that can be used as an appetizer or salad. This can be served on one platter, family style or as individual servings. The recipe is for four people, so multiply accordingly and as needed. The recipe does call for Wild Gulf Shrimp, which can be purchased already cleaned and deveined at any grocery store. Don’t use farm-raised, for all the reasons I have outlined in previous columns. The key to perfect presentation lies in how the ingredients are cut, and that method will be outlined. Now let’s get to it. First, cut ends off tomato and set aside, as they will be used in the sauce. Proceed to slice tomatoes 1/2-inch thick, for a total of eight slices; two per serving. When slicing the red onion and radishes, first, cut the ends. Then seat the onion and radish on one cut end, slicing downward and in half and then proceed to slice into 1/8-inch thickness. This is a simple step when used adds a cohesive and finished look during presentation. To cook the shrimp, first clean and devein, unless you’ve purchased them already cleaned. Place in a baking pan with at least a one-inch side on it. Season lightly with sea salt, fresh ground pepper and garlic powder. Pour a bit of water in the bottom, which will create the steam needed to cook the shrimp. Place in preheated, 350-degree oven and bake for approximately 15 minutes, or until shrimp turn a slight pink. Over-cooking will cause them to be tough. When they’re done, remove from oven and set aside, allowing them to cool. In a bowl, mix 1/2 pint of ketchup, horseradish, garlic, scallions and tomato ends. Mix well and set aside. To assemble for family-style presentation, lay tomatoes out, side-by-side in a long serving dish. Next, evenly place onion, radish and cucumber slices over tomatoes and then sprinkle with scallions. Place shrimp one on each tomato slice. Squeeze the lemon juice over the salad. To soften the lemon(s), roll gently on the counter, prior to cutting. Finish with one dollop of sauce in the center of each shrimp. 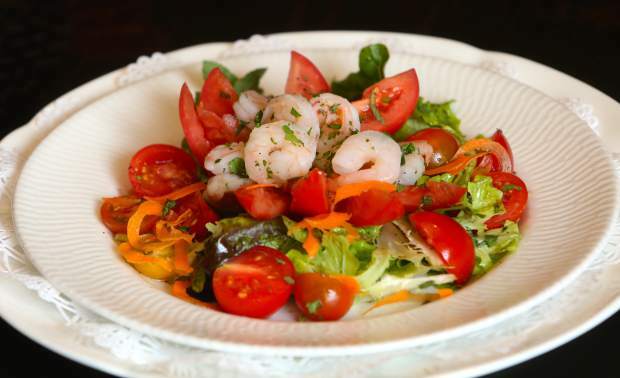 For individual presentation, use two tomato slices and two shrimp per plate, dividing other ingredients equally over each. I would serve this with a lovely Cline Cellars’ Pinot Noir, or ask your wine expert at any local wine and spirits shop for their recommendations.